It serioulsy feels as though everybody I know has had a birthday this month. People need to find alternate ways of staying warm in the depths of Winter because the resultant avalanche of birthdays in March is a little overwhelming. It might have been only five birthdays but it seriously felt like a lot more. And despite my careful plans, it all snuck up on me by surprise and I’ve spent the last two weeks feverishly making things. In fact, I’m still in the process of making one of those things and I’m on a bit of a deadline: if I’m not finished by Friday, then my dad is only getting half a present for his birthday. So far, I’ve made two mug cosies, half of my dad’s present and a crocheted coat-hanger, which was possibly my favourite. You know you’ve done well when it’s particularly hard for you to part from something you made. Luckily, I can make one for myself, but it probably won’t be for a little while as I’m looking forward to taking a tiny break from hectic making. I had a plan, you see. My work colleagues’ birthdays were entered into my calendar and I set up alerts to give me plenty of advance warning… and at some point over the Summer holidays, this all evaporated, leaving me with mere days to get my act together instead of the weeks I’d anticipated. On the up side, I’ve acquainted myself with rough dates for upcoming birthdays and am preparing myself well in advance. Months in advance, in fact. One person is having a significant birthday and since I know exactly what I’m making for them, I see no reason not to start on it right now. It would be good to work in some variety for the other presents, though. I do have some ideas, but I wouldn’t mind some more. So tell me: what’s your favourite thing to make for a present? Bonus points if you can link me to a pattern. In the meantime, I’m this close to setting off for a short stay by the bay with some of the Failboats. I’ll see you on the other side of that! I don’t usually make gifts, but I do love sewing quilted kitchen items – pot holders, tea cozies, whatever I can. I never thought of crotchet coat hangers! Pot holders are a favourite of mine, too. They’re such handy things! I’m not so much a maker like you, but I do make gifts! For our last anniversary (which was 361 days ago!) I gifted The Mister a ‘book’ of 52 Things I Love About You. A deck of cards forms the book, you come up with 52 things, stick one thing on the back of each card, and you get 4 chapters of 13 pages 😉 I found it on Pinterest. I also make prints for gifts as well from my digital art work, but I don’t do that often. The 52 Things idea sounds rather lovely. We both love playing card games, so it would appropriate on more than one level! Prints are a great idea, too. I have a plan for Christmas presents based on my photography – it’s amazing what you can come up with as gift ideas when you’re determined to stay out of shops. 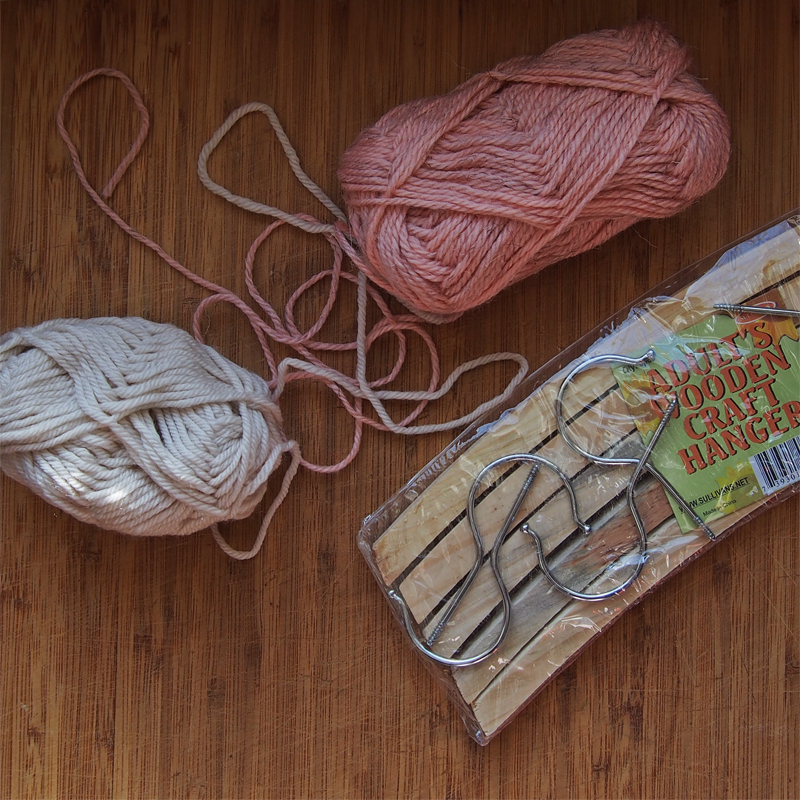 I always have a dig through the basket of hangers at my favourite op shop, looking for some nice, thickly padded knitted coat hangers! One day I will get around to making some myself. Great present idea! I have been making freezer paper stencilled t shirts as birthday presents for my youngest son’s friends ( minecraft & TARDIS pics mainly!) . I sewed some fabric scarves for Christmas gifts – but forgot to take photos before giving them away. Covered hangers are the subject of some serious love out there. As someone said at work: Once you go padded, you can’t go back to normal… (or something very similar, at any rate). I love that they’re useful but still decorative – the best type of present! I love the idea of doing prints. There’s one person I’m having difficulty with, so I might need to have a serious think about prints and whether I could branch out.